Venetian tradition places the election of the Republic's first Doge in 697, supposedly at a convocation in Heraclea called by the Patriarch of Grado. That account seems to hopelessly confuse the role of several early figures who were merely provincial Byzantine officials. The actual event must be found 30 years later. 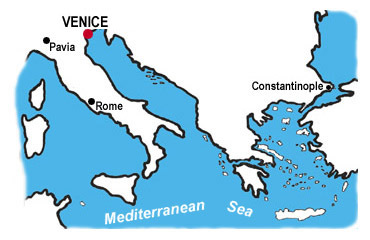 Through most of the 8th century, the Lombard kingdom centered at Pavia in north central Italy continued to chip away at the remaining Italian territories of the Roman [Byzantine] Empire, which by then was based in far-away Constantinople [modern-day Istanbul] with an Italian seat of government at Ravenna. In 726 a wave of unrest swept through the communities of Italy that remained subject to the Byzantine Empire. The cause was ostensibly a religious issue--a decree by the Byzantine emperor forbidding the use of icons and holy images and requiring their destruction--but other simmering frustrations must have fuelled the controversy as well. The anomoly of the decree was that, while most of the Byzantine Empire answered to the Greek Orthodox church headed by the Patriarch at Constantinople, the Italian portion of the Empire remained loyal to the Pope at Rome. Encouraged by Pope Gregory II, the Italian cities quickly began to claim independence from Byzantium and elect their own local leaders. The rebellious period passed quickly, as it became clear that the Byzantine emperor's decree would have no real force in the West and that at least nominal sovereignty by the Byzantine Empire was valuable in keeping the Lombards at bay. The entire episode might have passed with little note in history were it not for the particular result at Venice. The leader elected there in 727 with the Latin title of Dux (or, in the Venetan dialect, Doge) was Orso Ipato. The process of electing a local Doge was continued after his death in 737, making him the first elected leader of a republic that was to survive almost 1,100 years--the longest lived republic in history.